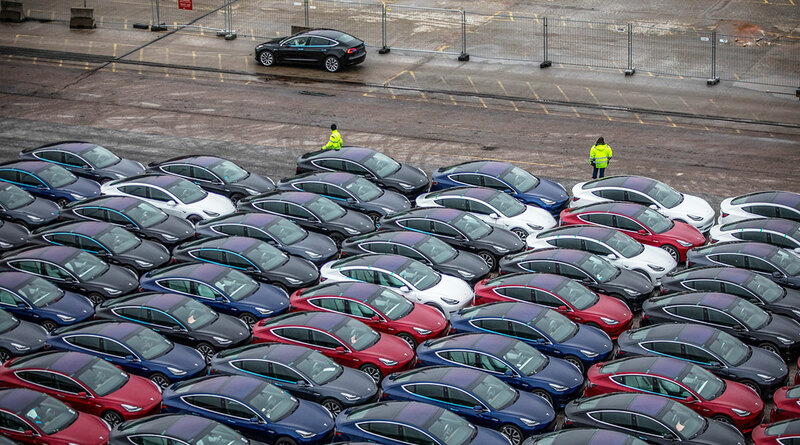 An experimental tool built by Bloomberg to track the rollout of Tesla’s Model 3 electric car suggests production total could approach 80,000 cars, far higher than the average analyst estimate of 64,400, according to research firm Visible Alpha. The gap between Bloomberg’s projection and the Wall Street consensus is more than $800 million worth of Model 3 cars. The Bloomberg tracker relies on two sets of vehicles identification numbers: those Tesla registers in batches with the U.S. government before production and those submitted by new owners to Bloomberg after delivery. There’s been a flood of new VINs as Tesla rushes to deliver the car across multiple continents for the first time. Submissions have been notably frequent from Norway, Germany, the Netherlands and Switzerland. A new lower-priced edition of the Model 3 — the $37,500 Standard Range Plus — has finished strong in the United States. There’s little known about the launch in China. Amazing work by Tesla Delivery teams, especially in Europe & China! Most insane logistics challenge I’ve ever seen. Thanks also to many country & city officials for your help this weekend! Super appreciated. Being so far out of step with market expectations is an uncomfortable place to be for an experimental model. The tracker has been extraordinarily accurate so far, beating Wall Street’s average estimates every time and coming within less than a percentage point of forecasting Tesla’s actual output over the two past quarters. But there’s some reason to believe the international expansion of the Model 3 could have inflated Bloomberg projections this quarter. Auto investors typically care more about deliveries — the point at which a company can book revenue — than production. But Tesla’s Model 3 has been anything but typical, with a brutally slow ramp that took a year to reach profitable production rates. There also have been continuing hiccups with deliveries, which for Tesla go directly to customers rather than dealerships. Analysts believe the international rollout over the past few months will end up suppressing delivery numbers, if cars can’t be unloaded from ships and delivered to customers in time. On an earnings call in January, Musk warned that about 10,000 cars could be stuck in transit at the end of the quarter — and since then things appear to have gone further awry. Ships were delayed due to a worker’s strike in Belgium, and China temporarily halted deliveries after incorrect labels were discovered on some cars. Undelivered cars don’t pay the bills, and Tesla’s finances remain under stress. The company started the year with $3.69 billion in cash but had to pay off a $920 million bond. In February, Musk told reporters that Tesla probably would be unprofitable this quarter due to the in-transit cars and one-time charges after a round of layoffs. Analysts expect more than $270 million in negative free cash flow this quarter, according to a Bloomberg survey of seven analysts. The Model 3 has been racking up strong sales everywhere it lands. It became the fifth best-selling sedan in the United States — outsold only by Toyotas and Hondas — for the second half of 2018. In Norway, which publishes registration data in real time, March sales easily topped the country’s all-time record for most vehicles sold in one month. Quarterly sales in the Netherlands surpassed the second- and third-best-selling EVs combined. The big question that remains unanswered is what levels of demand the Model 3 can sustain. After two quarters of breakneck sales in the United States, investors will be looking for fresh signals. That could be especially difficult after Tesla tinkered with sales prices at least three times this quarter. Prices are significantly lower across all models, and the base-model versions of the Model 3 only became available in the United States in the final month. Adding to the uncertainty is the fact that unlike other automakers, Tesla typically doesn’t break out sales by geographic region. The international expansion might be overheating Bloomberg’s production model this quarter. The vehicle identification numbers that feed the Model 3 Tracker contain a distinct numerical sequence to indicate cars destined for overseas delivery. Tesla has registered more than 139,000 VINs this quarter — an unprecedented jump for the electric automaker. Those international VINs inflated the Bloomberg model so quickly that the projection required a new statistical smoothing method, which spread the extreme surplus out over a quarter. Until Tesla reports its latest production numbers, there’s no way to confirm the accuracy of these changes.